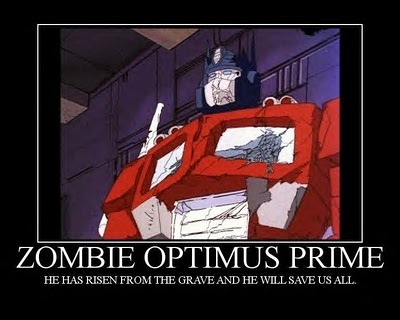 Zombies And Toys: Transformers Prime: Darkness Rising - Zombie Transformers? 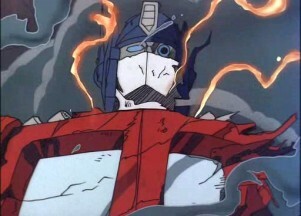 Transformers Prime: Darkness Rising - Zombie Transformers? For many years, zombie fans have only thought that it was possible for the living to be reanimated. In this, I mean that we all assume that for a zombie to exist they must come from what was once living tissue and flesh. On top of that you have the generalized infectious properties of the zombie plague/virus that are apparent in most popular series. Then we have Hasbro come along and put together two juggernauts of fandom in a way many did not think possible. Released this past year, we have a five part mini-series created by Hasbro entitled Transformers Prime: Darkness Rising. Originally shown to the public on the Hub programming block, it is now able to be seen in syndication on that network as well as on their personal site. With this seriesl we see the return of Megatron after the battles that took place on Cybertron in the same universe as that of the Transformers: War for Cybertron videogame. In this story arc, he is still planning on conquering the planet Earth by utilizing what is referred to as the Blood of Unicron. 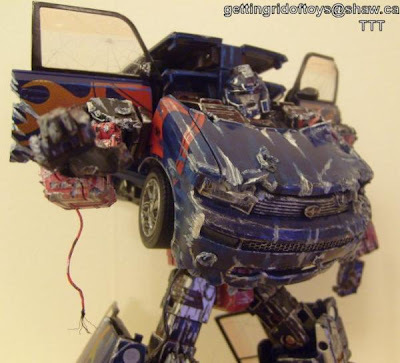 By utilizing Dark Energon he is able to fuse it with himself and resurrect an army of undead warriors of Autobot and Decepticon origin. With this groundwork in place, we are then able to enjoy a great bit of storytelling including zombies in the universe of the Transformers. This is a very good show; however, it is not without a few issues. First and foremost, as far as I am concerned, the best iterations of the Tranformers were in the 1980’s cartoons. In this mini-series they are rendered by Hasbro in three dimensions. This adds depth to them without causing a lot of the problems that watching the Transformers live action movies. Here you are given the ability to watch the battle scenes without feeling sick. The voice acting here is top notch as is apparent in any iteration of Transformers that Hasbro puts their name on. The other biggest complaint I have is that you really don’t get a whole lot of zombies. If you look at this series in terms of the five episodes that comprise it, you will see only about two full episodes worth of zombie goodness. Keep in mind also that these are not your typical zombies that search for flesh of the living. They are mindless drones driven to destroy and nothing more. The only real reason you can call them zombies is because they have been resurrected from the dead and that slicing them up doesn’t necessarily stop them. This is a great mini-series story arc, but you should not look at this in terms of a zombie story. 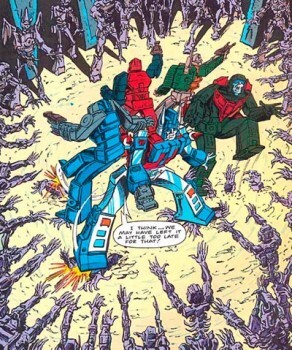 This is definitely a Transformers story, with the zombies thrown in to show a sense of urgency. If you are a Transformers fan then do not pass this up as it truly is a good story with great action and great voice work combined with enough drama and action to leave you wanting more. If you are looking to watch this for the zombies, then unfortunately you will probably be disappointed as they don’t earn enough screen time for the amount of hype they are given. Zombie issues aside, this is still a fun time for anyone watching it. If you would like to watch the episodes for yourself you may do so for free at The Hub where you are able to stream all five episodes for free. Wow, whether the show is loaded with zombies or not, I want that Optimus Prime zombie model shown in the final picture. That looks amazing!